Desk Sign With A Pedestal Can Show Off Your Name Or Significant Message. Choose From More Than 35 Fonts And More Than 30 Plastic Insert Colors. Contact Customer Service To Customize Your Anodized Aluminum, 2" X 8" Sign With A Silver Frame.. 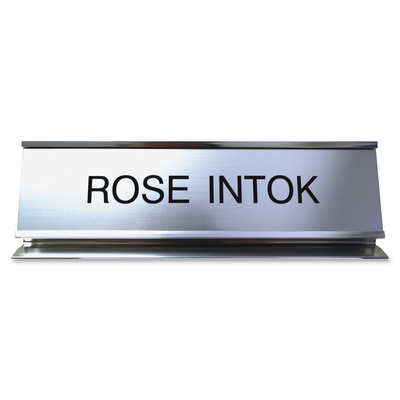 Desk Sign With A Pedestal Can Show Off Your Name Or Significant Message. Choose From More Than 35 Fonts And More Than 30 Plastic Insert Colors. Contact Customer Service To Customize Your Anodized Aluminum, 2" X 8" Sign With A Silver Frame.